How to Fix Image Thumbnail Not Appearing Bug in Blogger If you use blogger to daily push out new updates to your blog, then this morning you might have noticed your entire image thumbnails suddenly got disappeared from the homepage of your blog. This leaves you thinking that you may have done some unnecessary editing to your template, which might be the reason image thumbnails are not appearing on the homepage or archive pages. However, that’s not the case, image thumbnails are broken because of a new bug that recently blogger users are facing. Today in this article, we will show you, How to fix image thumbnail not appearing bug in blogger. If you use blogger to daily push out new updates to your blog, then this morning you might have noticed your entire image thumbnails suddenly got disappeared from the homepage of your blog. This leaves you thinking that you may have done some unnecessary editing to your template, which might be the reason image thumbnails are not appearing on the homepage or archive pages. However, that’s not the case, image thumbnails are broken because of a new bug that recently blogger users are facing. 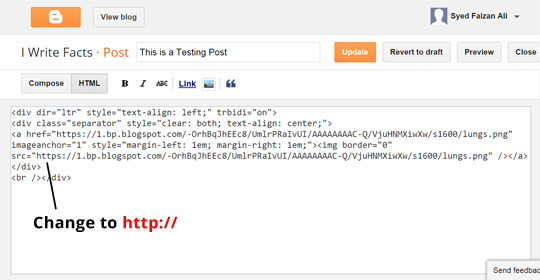 Today in this article, we will show you, How to fix image thumbnail not appearing bug in blogger. Why Image thumbnails are not appearing? Since yesterday, my newly posted pictures are lacking the thumbnail. I figured earlier that the thumbnail does not get generated if all images are sourced from an external host. That's why I always upload the first photo via Blogger's upload option so that a thumbnail is created automatically. But since yesterday, that is no longer working. I tried to create a second post today (now the latest post) just to see if the issue was related to that specific post. It appears the issue is site-wide. Help will be appreciated. Thanks. All of a sudden the images doesn't show up anymore om my homepage. I have this with every website with the vortex template from templateism.com.. Can you please help me fix it? The problem happens even in the Popular Posts widget and the "data:post.thumbnail" tag, only for posts published today. That's a major issue. Try publishing a new post by uploading an image, add a title, little post content and press publish. Now go to your blog and you’ll still don’t see your image thumbnail on the home page. This might make you lose your calm but we have a simple solution to this bug. How to fix image Thumbnails stopped appearing in blogger? Upon finding, replace all the URLs that are starting with https:// to http://. We have attached a screenshot below which will help you understand better. Please note: If nighter https:// nor http:// protocol is attached to your image URL then, search for src="// and replace // with http://. After making changes, publish the post again and your image thumbnails will start appearing again on your homepage. The issue is caused by blogger, which is not giving permission to https:// image thumbnails to appear. However, we hope this bug would be completely fixed by blogger sooner or later. We hope this quick tip has helped all those users who were continually sending us emails about image thumbnails not showing on the homepage. This article would certainly make them feel relaxed about their site. Do let us know if you’re facing the same bug and what precautions you have taken to fix the bug?